JULIAN GATHERING: This discussion group meets for contemplative prayer and study on the 2nd and 4th Wednesday of each month from 9:15-10:15 a.m. in the Cry Room. 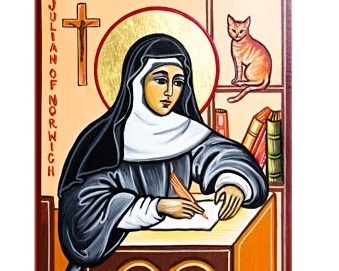 Julian of Norwich was a fourteenth century mystic and author of The Revelations of Divine Love. Julian’s insights serve as a catalyst for discussions on prayer, faith, and other spiritual topics. The group will be reading Julian’s book again from the beginning, starting on April 25, 2018. This will be a great time to join, although newcomers are always welcome. Extra copies of the book are available at each meeting. For more information, please contact Lanny Wase at Lannywase@mac.com.